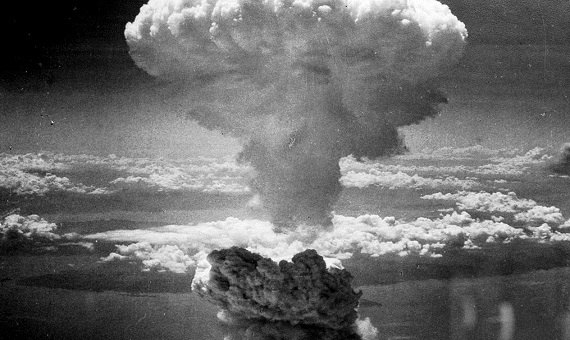 At 8:15 am on August 6, 1945, a nuclear device called Little Boy loaded with uranium-235 destroyed Hiroshima (Japan). The launch of two atomic bombs on Japan –which ended World War II– was the outcome of a plan that the United States had been developing for more than six years, the famous Manhattan Project in which some of the most prestigious scientists of the time participated. One of them was Enrico Fermi (1901-1954), the Italian who has gone down in history as the architect of the nuclear age for developing the first nuclear reactor, such as those found in nuclear power plants. Atomic bomb mushroom clouds over Nagasaki in 1945. Credit: US National Archives. Fermi received his doctorate in physics from the Scuola Normale Superiore di Pisa in 1922 and at the age of 26 he began to work as a professor at the University of Rome La Sapienza. There, his infallibility to predict the results of the experiments became so characteristic that his companions began to call him Pope, the Pope of Physics. He was prolific both in the theoretical and experimental fields, which was an exception in his time, and he is considered to be the last physicist who made great contributions to both branches. He began by dedicating his career to the theoretical part and made significant contributions to quantum theory, particle physics and statistical mechanics. From 1934, he focused more on the experimental part and following the path of the research of Irène Curie –the daughter of Marie Curie and also a Nobel Prize winner in her own right– he began to study artificial radioactivity by bombarding elements with neutrons. This research earned him the Nobel Prize in Physics in 1938 for having demonstrated “the existence of new radioactive elements produced by neutron irradiation processes” and for having discovered induced radiation due to slow neutrons. It was the first step to unlocking the secrets of nuclear fission. 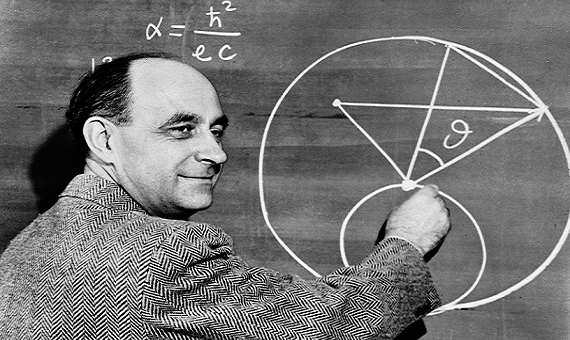 Enrico Fermi, who led the experiments on Chicago Pile-1 leading to the first man-made controlled nuclear reaction. Credit: Argonne National Laboratory. That same year, Fermi and his family decided to flee fascist Italy to take refuge in the United States. Clearly apolitical, Fermi had been accepted by Benito Mussolini as one of the 30 distinguished personalities who formed the Royal Italian Academy in 1929. For nine years, the scientist was able to ignore the rise of fascist ideology. However, when in July 1938 Mussolini launched an anti-Semitic campaign that could have harmed his wife, Laura –the daughter of Jewish parents– Fermi decided to plan their escape. They took advantage of the Nobel Prize ceremony in Stockholm to travel from there to New York. He continued his research in 1942 at the University of Chicago, where he would go down in history as the creator of the first nuclear reactor, called the Chicago Pile-1, a project that he and his colleagues developed on a squash court under the stands of an abandoned stadium of the university and decided not to communicate to the then president of the institution for fear of being stopped. There they achieved the first self-sustained chain reaction, which allowed the continued release over time of neutrons, a key discovery in the development of the atomic bomb and also, later and in times of peace, in the creation of nuclear power plants. After the war, Fermi was director of the new Institute of Nuclear Studies at the University of Chicago where students from all over the world came to study with him. He died on November 28, 1954, just 53 years old, due to stomach cancer. Regarded by Time magazine as one of the most influential people of the twentieth century, his legacy continues today in the dozens of things named in his honour. Not only is the atomic element number 100 called Fermio (Fm), but his name also presides over the FermiLab particle laboratory, the Fermi Gamma-ray Space Telescope, a prestigious award, three nuclear installations and several streets in his native Italy.